UNITED NATIONS, September 28 -- On Kosovo, the gap between what is said outside the Security Council and what others claim was said inside continues to grow. Wednesday the UN's acting head of peacekeeping Edmond Mulet briefed the Council about violence in Northern Kosovo. Afterward Russian Ambassador Vitaly Churkin told the Press that the "actions of KFOR are a clear breach of status neutrality, contrary to assurances that Secretary General gave to Foreign Minister Lavrov that KFOR is going to take steps on status neutrality." 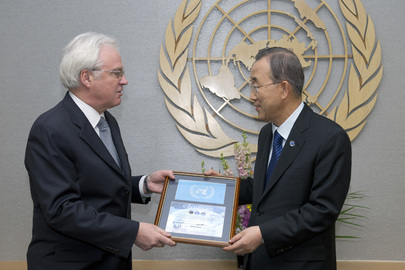 Inner City Press asked Churkin if the UN mission UNMIK should do more. Yes, he said, "we expect a new UNMIK head to be appointed before too long. We ask for UNMIK to investigate the situation... the cartfidges should not be lost. We expect UNMIK to give a clear assessment of the actions of KFOR and EULEX as out of line with their mandates." But moments later, when Inner City Press asked the UN's Edmond Mulet if there would be such an investigation, Mulet said, "It wasn't mentioned." So which is it? Watch this site.